Totally agree JZ ..but I have to admit ..for the nostalia value .. I shall enjoy the floppy installation process. Sometimes I do like to live life in the slow lane..
Told my bother I was renovating a T4900CT ..and sent him a photo.. He recognised it immediately ..and said he had one in his attic. Defective keyboard ..knackered hard drive...fubarred floppy as was mine ..dead battery..
it will almost certainly be the neoprene rubber belt decomposed. but now I have answers. Anyway ..it is in the post ..and making its way from London to Manchester..
Nice gift ...and it's not even my birthday. I'll see if I can find another backup HD. I hope it's the drive and not the controller. But I'm still trying to get those bios dumps uploaded. Here are the bios files. Had trouble figuring out how to add them. Zipped them together. Hopefully they'll be readable by the time you get them. Looking forward to what you find out. So I think I need a bit of help here ..regarding the T4900CT .. I have an 8gb SSD which I want to use with this laptop .. It is possible according to this youtube video.. But I couldn't create partitions with Fdisk ..
Ok ..went looking for the last/latest bios for the T4900 .. The hunt was on then for a 720kb floppy .. I found one and have flashed the bios successfully. ..but still cannot use the SSD .. The partitions are all 2gb or less ..and fat32. it has to be something obvious ...and stupid on my part..
Hamby wrote: Okay, I dumped the BIOS /VGA roms, copied them to a floppy, copied them from the floppy to the dos/wfw machine, copied them over the network to my desktop. During the copy of BIOS.BIN from floppy, I got a read error. I ignored it and the copy completed. Please post that file and hopefully it will be OK this time. Vipersan wrote: So I think I need a bit of help here ..regarding the T4900CT .. Your BIOS doesn't support the drive. And the partitions created with your main rig are therefore garbled data for it. "But I couldn't create partitions with Fdisk .." - So you had it booting with it before in the 4900 and cant use it/boot with it ater you installed partitions somewhere else?. If so maybe try the following (I couldn't watch the video you linked, so I havn't seen his procedure, maybe he had luck and the drive characteristics were better suited for his BIOS...): Wipe the drive completely clean again and put it back into the 4900 and first use overlay software like EZ-Drive. IT will let you create partitions, and translate the c/h/s data for your BIOS, so it can boot from it. You need to have a bootdisk of the desired OS to be installed afterwards handy (in your case Win95, I guess?) Also, 2 GB is the limit for FAT16 so you can go beyond that. For example if during EZ-Drive install you insert a Win95 FAT32 compatible or Win98 bootdisk, you can make larger partitions. The drive needs to be completely clean and you first need to boot from easy drive after you put it back into the 4900. I have the exact same behaviour with older laptops when they sometimes don't accept the blank SD/CF I put in. Sometimes I cant even boot to install overlay software and I install it by putting it into another machine and do it there, so try that if you can't boot with it in there at all. But from what I understood you could boot from it in the 4900 since you mentioned not having any success with fdisk. But it's always best to install and create partitions ons the machine its intended to be used with. Last edited by jaZz_KCS on 2018-2-02 @ 12:29, edited 2 times in total. 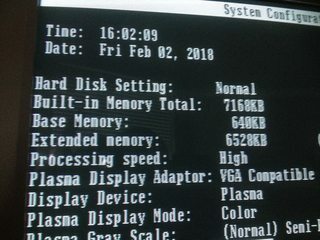 Eh, a 20Mhz 386-SX running Windows 95? That must be slow as hell... Even Win3.1 runs slow on my T3200SX (16Mhz). Yeah, the Librettos are really nice machines, albeit the train has pretty much left the station with these ones, they are getting rare and extremely expensive. jaZz_KCS wrote: Eh, a 20Mhz 386-SX running Windows 95? That must be slow as hell... Even Win3.1 runs slow on my T3200SX (16Mhz). Not quite, the T5200 is a 20 Mhz 386DX, not SX but I fitted 386 to 486 upgrade processors to my T5200s (the Cyrix / TI CPUs) which run at a clock doubled 40Mhz and give a significant boost to performance of 3x to 4x. Having said that, the VGA adapter is a real drag on performance but the CPUs make Win95 and even NT4 (yes it actually runs NT4!) quite usable for networking, file management and general messing around although they would probably grind to a halt if you ran any serious app. The machines all have 14MB of memory as well which helps and that's why I like the T5200 over the earlier ones as you can do upgrades like that, the processor is soldered in on the T3200SX so doing a similar upgrade would be very high risk and impossible for most people. jaZz_KCS wrote: Yeah, the Librettos are really nice machines, albeit the train has pretty much left the station with these ones, they are getting rare and extremely expensive. The only mods I've done to my librettos so far is to fit CF cards and internal wireless PS/2 receivers so I can use wireless mice with them without needing any form of docking station. Last edited by IanB on 2018-2-02 @ 12:30, edited 1 time in total. jaZz_KCS wrote: Do you have any tips/examples for me when it comes to acquiring additional memory? I'm going to post a how to on upgrading the T5200 with standard 72 pin simms in my thread soon but that requires a lot of soldering. There are two CAS lines on 30 pin SIMMs: The normal CAS line on pin 2 and the parity CAS line (CASP) on pin 28. The T3200SX doesn't appear to use the CASP line so you have to connect that to the normal CAS line on pin 2 instead. To mod a SIMM, cut the line going to pin 28 on the SIMM and wire it to the line going to pin 2. This might be difficult depending on the layout of the SIMM so it might also be possible to modify the T3200SX motherboard instead but I don't have one so can't check if that's possible. I found this info online so haven't been able to try it but based on the parity errors you have seen, it seems to be a likely fix. posted by "Sam at 2012-08-26 22:55"
Adding more memory and upgrading the cpu on my 5200 are on my list of things to do..
maybe one day I'll get to run win95 on it..
First of all, IanB..: Awesomesauce! And thanks for the quick reply. 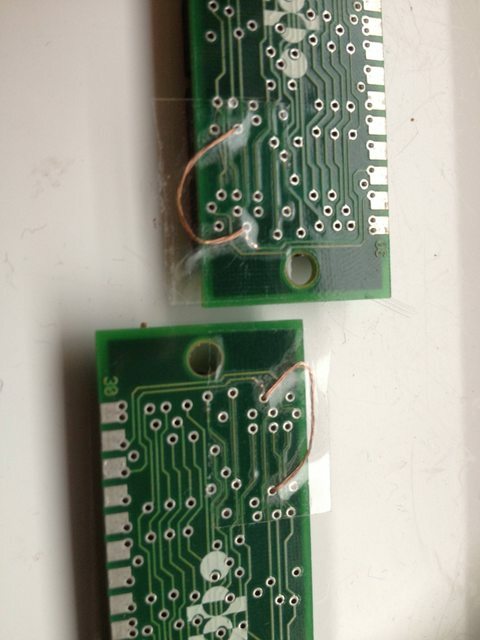 I then went to work finding the appropriate pins and traces, although it wasn't completely clear to me from Sam's and your description whether I had to (after cutting the trace to pin 28) connect the trace to pin2 or whether I had to connect the pin28 to pin2. After reading through a bit more I came to the conclusion it had to be trace to pin2. I didn't know how to properly "cut a trace" so I therefore went ahead and literally (carefully) cut the trace out with a sharp knife as seen in picture below. Making sure I don't damage any other trace. There are very tiny "cuts" visible in the traces going to pin28. 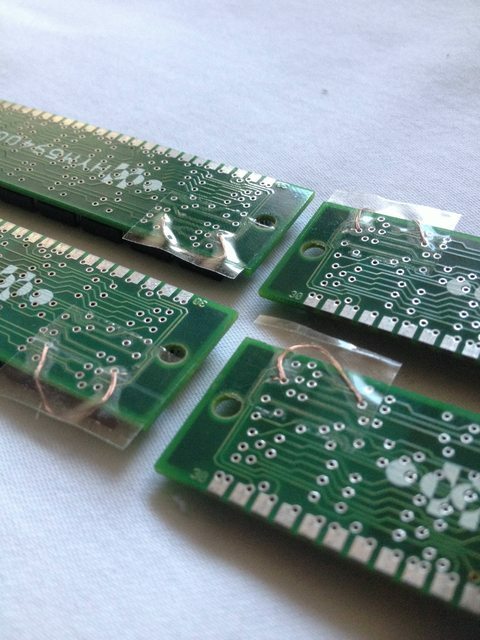 As you can see, I have not done any soldering (yet). The reason for that is twofold. Firstly I didn't know whether the modification was correct so I want to test it first. And second, but most importantly, I do not have soldering equipment fine enough (only a soldering gun from the 70s that;s rather bulky). So I went ahead and tape it in place, making sure the bare wires do not touch other traces. After doing that 4 times it was time to test. 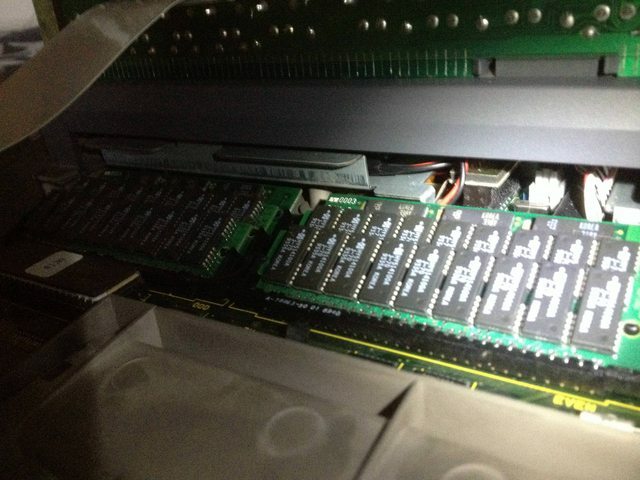 Memory placed back into the T3200SX in row after the two already present modules that I know do work. Thank you very much for your help, that was a quick and easy upgrade indeed, and even with parts from the basement, couldn't have gone better! Now on to the next project that is very much alike. 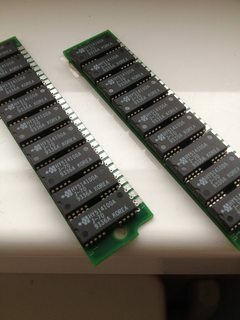 Trying to do the same and find modifiable memory that cen be made compatible with the IBM PS/2 L40SX laptop. Same problem there with regards the finicky-ness, albeit this time with FPM modules. I do have two memory sticks that work (8MB sticks from which the laptops can only use 2 MB each. But they always give me a boot error and after running automated setup 2 MB get cut off (since the laptop thinks it has now 18 MB total, and usually then cuts off 2MB from the last stick, which throws me back to 4MB total so what I have to do is do NOT run automated setup, so I at least have 6MB total. PS: Vipersan, did the overlay workaround work for yeh, did you have time to test? jaZz_KCS wrote: First of all, IanB..: Awesomesauce! And thanks for the quick reply. Thanks, glad it worked. I remembered reading something about a SIMM mod for the T3200SX in a VCFED forum thread a year or so ago but couldn't find the post again. However a quick Google search with the right terms found Sam's post with the same info. jaZz_KCS wrote: the two already present modules that I know do work. It would be interesting to look at those SIMMs and confirm they are wired the same way. I reformatted a floppy on my dos desktop... I think the two disks I've been using have not aged well. In any event, it formatted, I popped it into the T5200 (I think I'm going to call him "Oscar"... go ahead, ask me why ) and recopied the BIOS.BIN file again with no problems; popped the floppy into the drive on my dos desktop, under WFW 3.11 it copied with no problems, the transferred it over the network to my modern desktop. So here it is. (If it's still garbage, I'll do as you requested and make that .dmp file). I'm going to start messing with my autoexec.bat and config.sys on Oscar to cut out some of the things it runs (like norton) and then see about installing my ethernet adapter so I can access it directly from the network. Thanks, but it's still garbage, interestingly the middle section is different garbage so maybe the corruption was due to both the copy error and interference by a memory manager. I think a clean boot and using the BIOS ripper program is the option most likely to work. Okay, booted from the floppy, ran the program, dumped the BIOS, copied from C:\ to a:\, copied from a:\ to C:\ on dos desktop, transferred to main desktop, added to zip file, and now uploaded the zip file. Vipersan wrote: Looking promising .. I have also repaired the 800mb hard drive with original win 95 O/S on it.. There was a 2 amp surface mount fuse on the control board open circuit ..
took a chance and replaced it..
and the mitsumi floppy isn't a bad colour match either.. I luv it when a plan comes together.. Still got some reassembly ..but another hour should sort it. Then I may even consider re-building the Battery Pack ..